One of the most popular animated series on the planet has to be the absurd, sometimes frightfully realistic Rick and Morty. 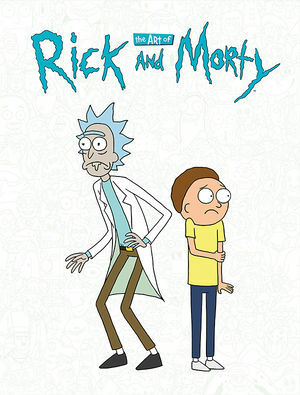 The misadventures of a genius grandfather and his not so genius grandson just returned for a third season, making for the perfect time to release The Art of Rick and Morty from Dark Horse. This hardcover book is something to behold, right from the artfully fantastic glow in the dark cover. The foreword is done in true Rick and Morty fashion, and sets the stage for an inside look at the blockbuster series. From character studies of the main and supporting cast to an in depth look the technology and weapons, environments, scripts and more, the book is a dream come true for fans of the show. We even get a glimpse at the animated short that started it all, which is a real treat. This book is THE resource for fans of Rick and Morty. The layouts are clean and easy to read, the artwork pops right off of the page, and some of the text comes straight from the “characters” themselves: from Rick explaining what Doofus Rick does to Summer breaking the fourth wall on the reader. If you are a fan of the show, or know a fan, this is the perfect book, and possibly perfect gift as the holidays are right around the corner. This is the definitive Rick and Morty book, hands down. You need this in your library- just make sure its not where you sleep, because that cover glows super bright!